With Bill Goldberg challenging for Kevin Owens’ WWE Universal Championship this Sunday at Fastlane, he has a chance to have one of the best matches of his career—if it’s a competitive match. By virtue of both the optimal way to book him and how it kept him from getting experience, he spent most of his career much greener than one would expect of someone at his level of push. As a result, popular sentiment as to what his best matches are is…hazy. With that in mind, if you want a taste of Goldberg’s best matches, here are the ones you should check out, all of which are available on WWE Network. This match is best known for the backstory, which snowballed into something of an urban legend. Regal was told to have a competitive bout with Goldberg, who had almost entirely been working squash matches so far. Regal was to have something resembling his usual TV match, where he could carry lesser wrestlers by putting them into holds and giving them openings to escape, and eventually cut him off en route to the finish. Goldberg instead freezes up, and at some points, he just stands there while Regal hits him. Between the clear miscommunication, Regal’s snug style and the awkward moments where they stared at each other as the cooperation fell apart, the story became that Regal “shot” on Goldberg. He didn’t, and in fact, even with Goldberg freezing, they had an entertaining match—Goldberg’s first good one. You’ve seen the finish to this a zillion times, but the match itself is actually very good. Hogan was, for whatever reason, considerably more giving and hard-working in TV bouts during this era, as almost all of his most entertaining matches as a heel (this one, his match against Diamond Dallas Page, his match against Bret Hart) came on Nitro. He did a masterful job pacing the match and carrying Goldberg, making him look like the biggest star in wrestling en route to Hogan dropping the world title. But WCW didn’t capitalize on the momentum nearly as well as they could have. The first thing you notice is just how hot the crowd is here. And why wouldn’t they be? WCW’s two biggest babyface stars are facing off in a clash of the titans for their world title. It could be longer, and it could have a better finish, but while it lasts, it’s exactly what it should be. Sting is at his best, with his uncanny knack for timing on big athletic spots, comebacks, and countermoves front and center. There are few things in WCW main events that got a reaction more reliably than Sting doing a tombstone piledriver: just look at how the crowd pops here. Sting is at his best when his matches feel like superhero vs. superhero or superhero vs. supervillain, and this is a great example of the former. This was Goldberg’s first “real” title defense on pay-per-view as WCW World Heavyweight Champion, having up to that point been mostly saddled with lame duck challengers. The babyface match where he defended his title against Diamond Dallas Page was his first real pay-per-view main event slot, headlining what had traditionally been one of WCW’s biggest annual events. A bad, boring match, especially if it compromised Goldberg’s persona, could pump the brakes on his momentum. Page, however, was the perfect opponent for Goldberg at this point. While some veterans criticized Page for it, his preference for heavily scripting his matches was exactly what his very green dance partner needed. The result was a simple, but highly dramatic match that stands the test of time not just as one of the best matches of Goldberg’s career, but one of the best main events of the Nitro era. Six months later, Page was WCW World Heavyweight Champion, having won a four-way match at Spring Stampede in a shocking upset. Almost immediately, he started a heel turn and went on a streak of main events way above the level of those that usually closed Nitro. The Goldberg rematch was one of these. While it wasn’t at the level of the Halloween Havoc bout, it was a really entertaining second chapter, which solidified Page’s turn. Unfortunately, it was also the end of what should have been the great main event feud of the Nitro era of WCW. In spite of all that, they had a great match, one that wildly exceeded all expectations. You know how Braun Strowman vs. Big Show was great because it was the best possible version of what a match between those two men should be? This was the same way: They beat the hell out of each other. It’s Goldberg’s best individual in-ring performance, the most heated match of the Russo era of WCW, the best brawl in the company in a long time, and maybe even the best overall match in the last 18 months or so of WCW’s existence. Enjoy it for what it is—just don’t watch any of what set it up, and pretend Russo never interferes with a rubber baseball bat. 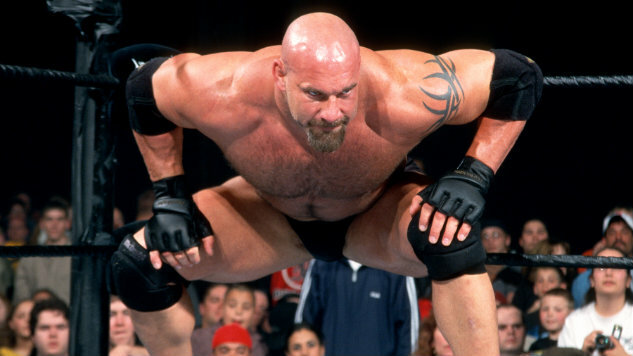 Goldberg started in WWE with a bang, his debut promoted out of nowhere with a promotional video after WrestleMania and the immediate start of a feud with The Rock, who was directly responsible for him being signed. WWE had little interest in Goldberg, but The Rock badly wanted to work a long-term program with him, so he got them to ink the deal. The Rock, who had been a puzzling mix of great psychology and awkward mechanics for most of his career, had really put everything together during his last real runs with the company in 2002 and 2003, finally looking like the in-ring performer you’d expect him to be given his athleticism. That he was doing great character work as a heel at this point was just a bonus. Here, he did everything in his power to make Goldberg look good, and put him over with an exclamation point in a really strong main event style match. But since he was frustrated with how Goldberg was booked in his first month in the company, The Rock bailed on the planned long-term feud. While Henry was still a good eight years away from fans respecting him as a performer, this was the time period where he really started to turn the corner. That he was the rare wrestler who could convincingly manhandle Goldberg, combined with his improvement and Goldberg’s own strides, turned this into a very entertaining power match. This was “officially” supposed to be Goldberg vs. Coachman…in a no disqualification match. Effectively, it was another Goldberg-Henry match. It’s more of the same as the previous match, except Coachman is sitting on the top turnbuckle the whole time, mugging like an idiot. You know that the match will end when Goldberg gets his hands on Coach, you just don’t know when. When it finally happens, it’s incredibly satisfying. Perhaps even more so 13 years later, when we’ve had to deal with the smug ESPN version of Coach. David Bixenspan is a freelance writer from Brooklyn, NY. You can follow him on Twitter at @davidbix and view his portfolio at Clippings.me/davidbix.